Dental Radiographs. Do We Really Need Them? Dental disease is a very common issue that arises with our pets. Signs of dental disease can include bad breath, excessive salivation, dropping food, broken teeth, decreased appetite, sneezing, bloody or purulent nasal discharge. On going dental disease can cause kidney, liver, and heart disease. With dental procedures we recommend dental radiographs and we are always asked why do we need to do that? What is involved, and is it really necessary? In short, we take dental radiographs or dental x-rays for the same reason our dentist does. To identify potential problems under the gum surface. Dogs and cats often go months or even years with severe dental disease without ever showing any signs of discomfort. In fact, they maybe in significant discomfort or even pain, but are unable to speak up. At least when we feel dental pain we know to call the dentist. Our furry friends rarely mention any discomfort during their annual exams. Below are some photos from a “routine” cleaning. We elected to take full mouth radiographs and found several diseased teeth that needed extraction. All of this patient’s teeth looked, and probed normally but as you will see they are in fact severely diseased. Had dental radiography been unavailable this pet would have had persistent dental pain, despite routine cleaning. You can see this mandibular pre-molar is diseased. 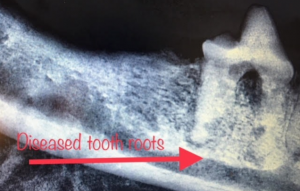 Both roots of this tooth are moth eaten and resorbing into the surrounding alveolar bone. This tooth looked normal on physical exam and even probed normally on dental exam. This Maxillary fourth premolar has significant bone loss around the highlighted root. There appears to be a “halo” area of boney lucency. This tooth is diseased and needs extractions. 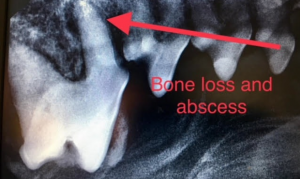 This tooth is most commonly associated with abscess formation and swelling under the eye in canine patients.